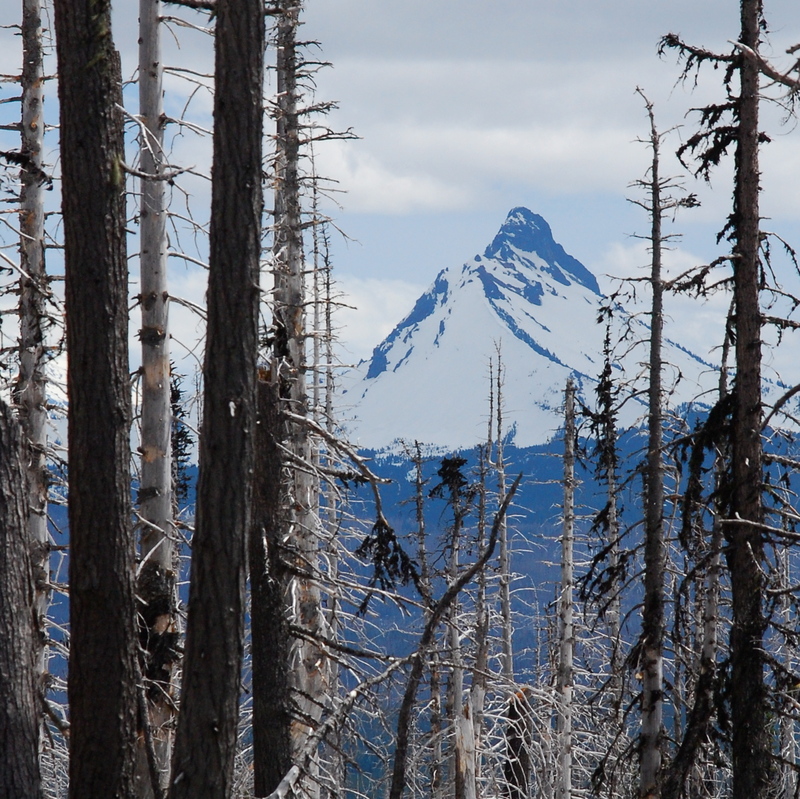 Adventure #18: Three Fingered Jack – Hi, Alpine. Mountain Mania. Alpine Affliction. Forest Fever. Whatever you all it, I had it, and bad. At over a month since our last hike together, I was going stir crazy and was burning with jealousy at all of Robin’s solo outings. Note that this is a loving jealousy burn which quickly extinguishes when I see him up until 4am grading undergraduate essays while I’m playing videogames. 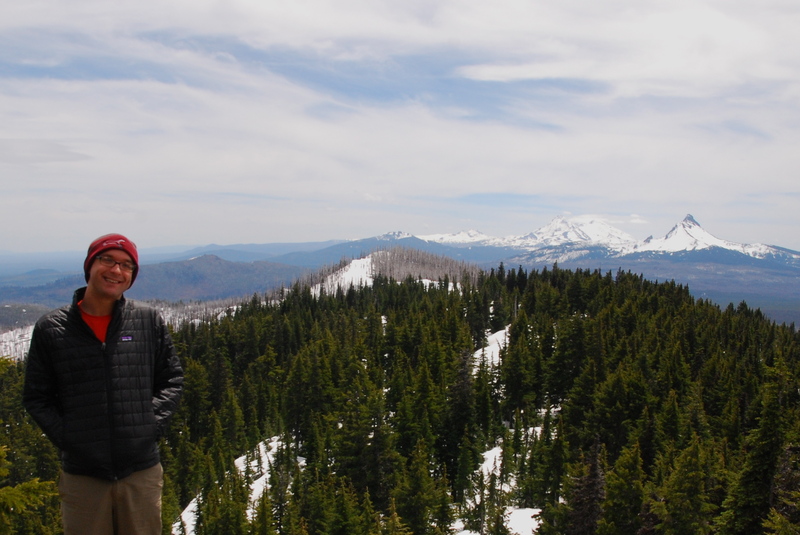 Our lots in life each come with their own pros and cons, but my office-bound situation and general month of crazy commitments had created a pause in my access to the outdoors, and I was a nutcase. After ruling out anything in the Gorge due to what was an assured onslaught of people and anything too high in elevation due to the snow situation, Robin picked a hike up the flank of Three Fingered Jack. We weren’t sure how far we’d be able to get due to the snow, but it was at least a field trip to a new area and we’d get as far as we could. We arrived at the trailhead around 8:45am, and while we were getting organized a group of youths came down from an overnight trip, reporting that they got snowed out not too far up and had returned early. Picturing sizeable snowdrifts and knee-deep postholing, we left following the Pacific Crest Trail north from the Santiam Pass Trailhead. 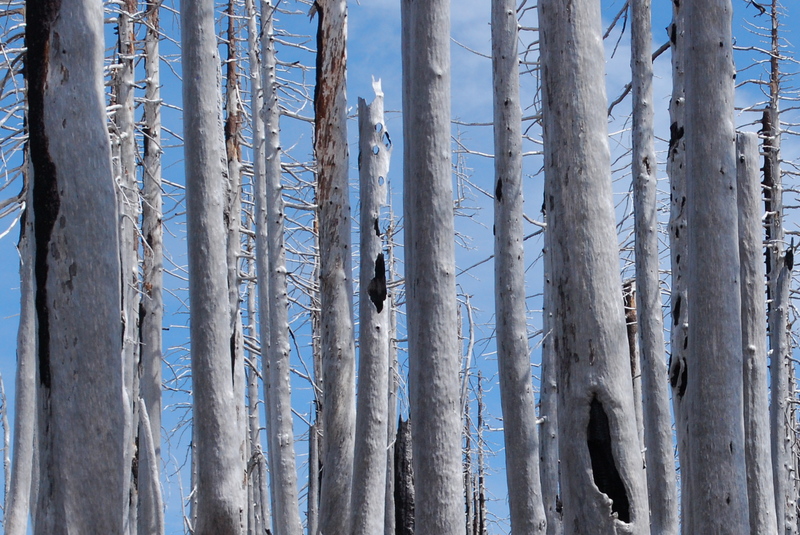 Most of the trail cuts through a massive burn area from the B&B Complex Fires in 2003. There is a fair amount of new growth reviving the lower areas with plenty of low shrubs and pine saplings a little shorter than we are, but the sheer scale of the fire’s devastation remained evident for the entire hike. We crossed occasional islands of trees that escaped the fire, but they were few and far between until we reached the ridge and its fringe of unscathed pines. The hike up maintained a gentle grade through beargrass tufts that were just starting to send out new shoots for the season. It didn’t take long for patches of the white stuff to start showing up in shady hillside alcoves, and before long were were crunching through a couple feet of snow, fortunately still hard enough from the cool morning that it resisted our weight and kept our going relatively easy. 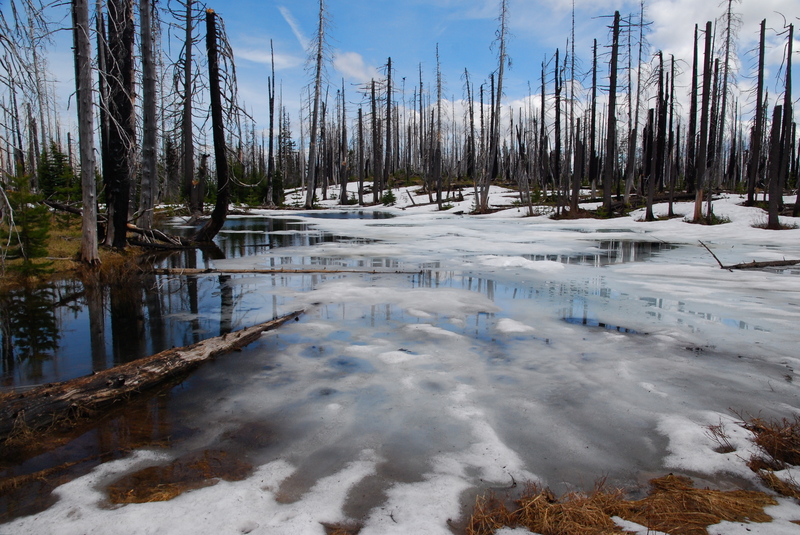 We came upon a large snowmelt pond that was about 2-3′ deep–with bright green grass valiantly trying to grow in the bottom!–and soon after angled up to the junction for the Santiam Lake trail. Keeping right to stay on the PCT, up and up we went, rapidly losing sight of the trail itself which was buried below now steady blankets of snow. We left ourselves GPS breadcrumbs and kept Three Fingered Jack dead ahead of us, slogging ever up through the snow towards the ridge. Near the top, the snow ceased for awhile and we found the trail again, now bare and easy to follow as its exposed and sunny location had helped it melt away. Looking back from where we started, we were treated to views of Broken Top, Three Sisters, Mt. Washington, and Hoodoo. 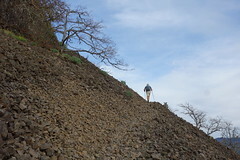 Our ridge trail swung over the top and what a difference the side of a mountain makes! Immediately the trail was engulfed by 10-12′ of snow, so we called it as “done” for the day and picked a spot to eat lunch: a large rock formation a bit further up Three Fingered Jack’s flank, melted out and possessing what we figured would be a pretty stellar view. We hacked up some snowbanks and clambered to the rocks, which proved to be an enviable perch. 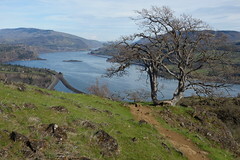 Dead-ahead were the previously-mentioned mountains, with Black Butte towards the southeast and Hayrick Butte with its cleaved-off plateau top to the southwest. Not too shabby for a May hike! After eating, Robin took the camera and went exploring a little bit further up Three Fingered Jack while I sprawled out on our lunch rock, covered my face with my hat, and napped in the sun. There was no noise save for the wind pushing some scrubby pines around me, and I realized very acutely how much I had missed being very high up on a warm rock with nothing better to do than laze around for awhile in a patch of hard-earned solitude. 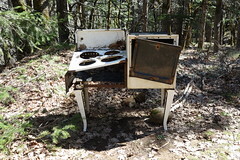 All of our winter and spring hikes in the Gorge had been wonderful, but this particular type of lonely alpine place only available for such a short window of time, this was what I missed. I basked and savored, and got momentarily giddy at the thought of all the high alpine spots we”ll be discovering over the next four months. Eventually Robin returned, and we packed up and headed back down the slope. The afternoon sun had significantly softened the snow, and our descent was more of a slushy slide than a pronounced trek. The segments of the PCT not covered in snow were now filled with trickles of melting snow, and the stream grew and grew the closer we got to the trailhead. We passed through the campsite of some guys who we had encountered on the way up, and we were disappointed to see that they’d left a large amount of litter, which we bagged up and packed out. They also had apparently had a campfire set up right in the middle of the PCT itself, which irritated me to no end. Who does that? I sifted through the cinders and found some foil candy wrappers they’d tried to burn but left behind, and added them to the collection of their garbage. Come on, people. We can–and must–collectively do better than this. So many ghostly faces in the trees!